"Solid Guide For Beginners On Mastering Text Game"
Easy to understand, practical advice that can be used to help you send more effective texts to women. Lots of examples provided. The principles shown here can be applied to how you interact with women face to face as well as on the phone. Some of the examples shown won’t work well on certain types of girls. You’ll need to adapt the ideas here to suit your own personality and style. A few of the areas aren’t covered in as much depth as they could be. This is a good product for beginners who want to learn a more playful and attractive way to text women. It covers a wide range of scenarios that you’ll find yourself confronted with at some point. If you’re at the stage where you’re getting phone numbers but girls aren't returning your texts or you're not getting many dates, this is definitely worth a look. 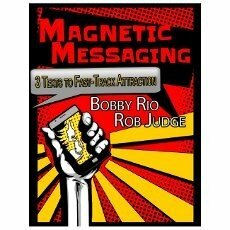 Magnetic Messaging is a collaborative effort put out by Rob (Date Hotter Girls) and Bobby Rio. It’s essentially a beginners guide that covers all things texting and phone-related. With most women practically having a cell phone super-glued to their hand these days, texting has become a critically important aspect of dating. This book aims to give you the tools and mindsets you’ll need to effectively communicate with women via text so that they will be excited to meet up with you. It covers various situations; including girls you haven’t had a date with yet, those you’ve been out with a couple of times and girls you’re already sleeping with or in a relationship with. The focus of the book is on how your texts should accomplish one of three things: spark her emotions, create a connection, or handle logistics. How and when to do these are covered in great detail, and is largely determined by what stage in the relationship you are at with the girl, and how well she is responding to you. A One Size Fits All Approach? Having seen some in-field videos of Rob before in his Advanced Dating Strategies course, the texts that he shows here as examples sound exactly like how he talks to women in person. Which is how it should be, but you need to make sure that your texts sound like YOU, and not Rob or Bobby. There is a short section on this in the book, basically saying that it’s important to have your own style and not be generic. It’s really an important point that needs to be emphasized, that the text messages you send need to be congruent with who you are. For example, a lot of the texts that Rob uses aren’t things that I would send myself. Not because they are bad or don’t work, just that they aren’t worded in the same way that I would speak to a woman. The principles are the same, but the specifics are different. It’s also worth noting that you’ll have to tailor these texts also according to the type of girl you’re dealing with. Some of the examples shown here from Rob have a sort of exaggerated, romantic idealism quality to them. Combining humor and intelligence, it works well on the women of New York that Rob is meeting, but there are a lot of women I know who wouldn’t understand it. For example, most women I know have never heard of Voltaire, so I wouldn’t use that particular text that mentions him. The same way that an older guy probably wouldn’t send the text jokingly calling her a player and asking her how many guys she was macking it to that weekend. Know yourself and your audience and act accordingly! Some things can vary depending on what city you are living in, so experiment and see what works best for you. One of the guidelines here is to text a girl in the morning and suggest meeting up later that evening or night. It’s recommended not to set up a date via text a day or two in advance. But this is something I and many other guys do all the time and it’s never a problem. In fact, I know girls who won’t agree to a date on the same day simply because they don’t want to seem too available, even if they have no plans. However, I don’t live in New York and this might be a better way to go about it there. So feel free to experiment and find what gives you the best results. The book goes on to cover more advanced topics, including sexting and getting her to send naked photos. There’s not a lot of depth in these areas, but given this book is mainly aimed at beginners it’s probably not the biggest concern for most readers. There’s advice on what to do when a girl is being difficult or flat out ignoring you over text, and how to reinitiate a conversation with girls you haven’t spoken to in quite a while. All sorts of variables are covered here with what you should do to give you the best chance of seeing the girl again, which should be your only real goal for texting. There is no such thing as a magical text message you can send that will make any girl love you, and the book clearly states this. Sometimes you can send a seemingly perfect text and still not get a response. It’s explained here that there could be any number of factors happening in a woman’s life that will cause her not to respond, things that are outside of your control. It’s important to focus on continuing to get new numbers so you can practice your texting skills and you’ll soon start to see your results improve. There are a lot of bonuses included here with this book, not all directly related to text game. There’s a book containing the 99 best texts of all time, to be used in different situations. There’s a nice PowerPoint presentation by Bobby on how to make a girl infatuated with you that contains a lot of good information. Also, a short report from Bobby on the 12 best conversation topics. Extra, unadvertised bonuses are also included which is a nice touch. Without going into too much detail, you’ll see some live presentations by Rob speaking on some interesting topics. I'm trying to see how some of the texts qualify as one of the "99 Best Texts of All Time." How is the above a "best text of all time?" Doesn't it communicate neediness, and set the frame that you're chasing her. Some of them are good (not great, or "best," IMHO), but it looks like half of them are uninspired AFC texts.